Step 1 Heat 2 tsp of olive oil in a Dutch oven over medium heat. Add in the breadcrumbs and garlic, and a pinch each of salt and pepper. Stir until combined and crumbly, mix with the parsley, and then set aside. Step 2 Return the pot to the low heat, add in a tsp of oil, and then add in the onions. Sauté over low heat until caramelized and golden, about 25 minutes. Add in the zucchini, and cook 2 minutes, until lightly golden. Add in garlic, and cook for another 30 seconds. Add in the herbs, bay leaf, thyme, and the tomatoes with their juice, and season with a pinch each of salt and pepper. Step 3 Bring the mixture to a boil. Reduce the heat to medium-low, add in the white beans and balsamic, and simmer for about 20 minutes, until the sauce thickens. Step 4 Meanwhile, bring the polenta water to a boil in a small saucepot. While whisking gently, pour in the polenta in a steady stream and whisk until thickened. Reduce the heat to low for about 30 minutes, whisking very hard every 10 minutes to make sure you get all the bits off the corners and bottom of the pan. Add in the olive oil, and season with salt and pepper to taste. Step 5 5 minutes before you’re ready to serve, stir the spinach leaves into the cassoulet until wilted. Then divide the polenta between four bowls, top with the bean cassoulet and a generous sprinkling of garlic breadcrumbs. You'll find a developed, complex flavor in this deliciously nutritious vegan dish. 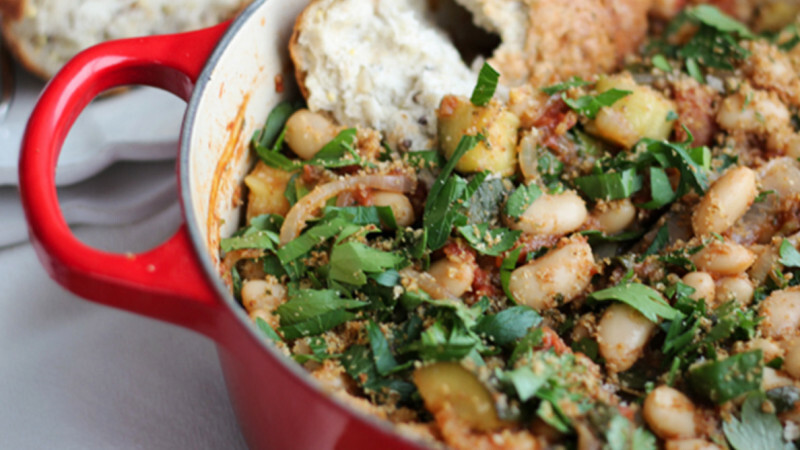 Although this cassoulet has multiple parts, the end result is worth it. If you’ve never tried polenta before Opens a New Window. (aka cornmeal), it is absolutely delicious and filled with nutrients. One cup of yellow cornmeal is an excellent source of fiber, iron, niacin, thiamin, and magnesium. If you don’t want all the carbs, then opt for a smaller serving.